Take the following survey to help us know what God is saying to the Body of Christ so that we could best inform and connect intercessors. As a Christian, which issue is the most important to you this election year? As a Christian, which political candidate do you feel best represents your views? Which of the following would be useful to engage your friends in praying for the election? Approximately, how many of your friends are so frustrated with the main candidates that they will not vote? Which Party's Platform best represents my views? 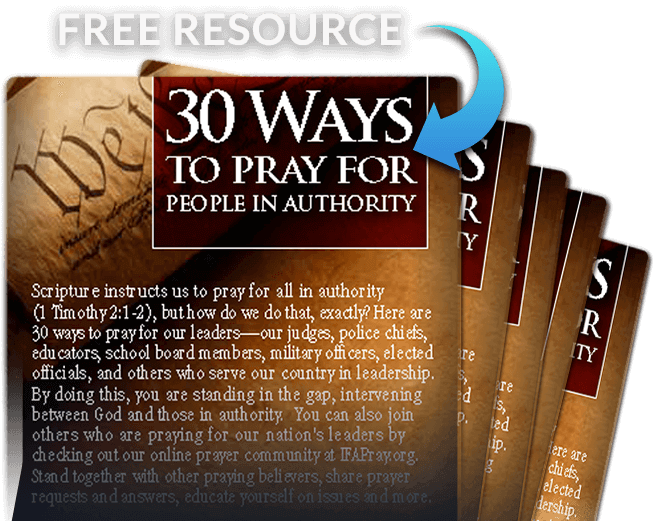 Enter your e-mail address to see how your answers compare to others, and to download your free resource "30 Ways to Pray for People in Authority"
* Check your e-mail for a link to download your free resource "30 Ways to Pray for People in Authority". * Fill out your address on the next screen or check your e-mail for a link to receive physical/printed copies of your free resource "30 Ways to Pray for People in Authority" via snail mail. Intercessors for America would also like to mail you a physical copy of this free prayer resource, "30 Ways to Pray for People in Authority". Share This Survey On Facebook! SPONSORED BY INTERCESSORS FOR AMERICA. This specific site, IFAPray.org, is a prayer-focused site and is not to be used for endorsing or disparaging candidates running for office. While IFA encourages all qualified citizens to vote, IFA does not endorse candidates, nor do we fund candidates. IFA has no political party affiliation. The sole purpose of this site is to encourage and facilitate prayer for the nation and the November elections. If this agreement is broken by any user, IFA reserves the right to terminate that individual’s comments, group, or membership to comply with this guideline. Members may post prayer requests, comments, and other content; send other communications; and submit suggestions, ideas, comments, questions, or other information, so long as the content is not illegal, obscene, threatening, defamatory, invasive of privacy, infringing of intellectual property rights, or otherwise injurious to third parties or objectionable and does not consist of or contain software viruses, commercial solicitation, chain letters, mass mailings, or any form of "spam." You may not use a false e-mail address or impersonate any person or entity. Any misuse of IFA’s web tools will result in the privilege being rescinded. Your agreement to these terms of service implies your agreement to follow our user guidelines. IFA takes no responsibility and assumes no liability for any content, links, or comments posted by you or any third party participating on IFA sites. Postings by third parties do not necessarily reflect the values, views, or practices of Intercessors for America. Nothing in the above guidelines should be seen as a deterrent to full participation in the exchange of ideas within the spirit and viewpoint of the Web site’s purpose. IFA sites may provide links to third-party external sites maintained by individuals, organizations, and IFA partners. These third-party sites are not controlled by IFA. The links to these sites are provided for convenience. IFA is not responsible and assumes no liability for the content of any of these sites, and unless expressly stated, does not endorse these sites or their contents, products, or services. IFA is not responsible for the content of any sponsor's Web page linked to the IFA Web sites, and the opinions and views expressed on any sponsors’ Web pages do not necessarily reflect those of IFA. The contents of the sponsor Web pages are not reviewed in any way before they are linked to the IFA Web page. All of the content, images, logos, and photos appearing on this site are copyrighted and are the property of Intercessors for America. Other images, brands, or logos are the copyright property of their respective owners. Information and images found on the site may not be reproduced either in print or electronically without the express written permission of Intercessors for America. Intercessors for America (IFA) will never sell, lease, or rent your confidential information, though non-confidential information (name and address) may be given to outside vendors for the purposes of serving our members. IFA will always take prudent steps to ensure that personal and financial information you provide to us will remain secure. IFA will respect and guard your privacy while visiting our Web sites. IFA does allow you to provide personal information on our sites. The type of information we collect directly corresponds with the service you request. For instance, you can make donations, request resources, share your thoughts, prayers, concerns, suggestions, personal experiences, and ask questions. The type of data IFA collects, such as your name and contact information is used only to facilitate our response to your specific request. If you request to have a resource sent to you and/or make a donation, IFA will collect the information necessary to complete this transaction, which may include your contact information, credit card number, and other transaction information. Respond to your personal correspondence, questions, or resource requests. Update, develop, design, and customize the content of our sites to meet the needs, interests, and requests of our members and audience. Contact you to pray for you, confirm specific resource or information requests, confirm subscription information, inform you of new products and special offers, provide information we think may be of particular interest to you. Communicate with you regarding programs, initiatives, and issues that are a part of IFA's mission and vision. Please direct all questions or comments to IFA at ifa@ifapray.org, 800-USA-PRAY (872-7729), or write us at Intercessors for America, PO Box 915, Purcellville, VA 20134.